So the dust has settled on a particularly big week at General Assembly. Over the week since my last post, Matt Thees (@mthees7) and I have built and launched Hopp (www.hoppto.it). Looking back at our initial whiteboard, as I did at the start of our product demo, I reckon 90% of our planning made it to release - I'm pretty proud of that. 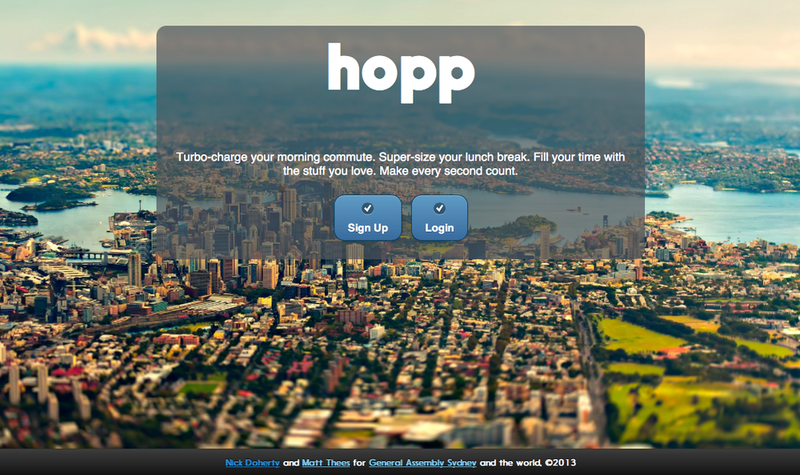 Hopp is a content discovery tool which aims to maximise your time online. You tell it how long you have and what your interests are, and it gives you back content. 'Fill your time with the stuff you love' is our project one-liner. In a broad sense we split the project front and back. Matt wrangled with the Soundcloud and YouTube APIs and, brilliantly, scraped Medium (which doesn't have an API yet) using Nokogiri. Our belief in the concept kept us going, both hugely keen to get this out to the world. We will continue working on it (adding Bookmarks next) as we genuinely think people may use it. My thanks on this are firstly (and most importantly) to Matt, who really excelled himself and did an A1 job, Daniel Tsui, Joel Turnbull for his patience in answering questions (dumb and not so), Riana Ferreira and Angie Gove for their endearing, enduring support and (as always) Jen Taunton for everything.